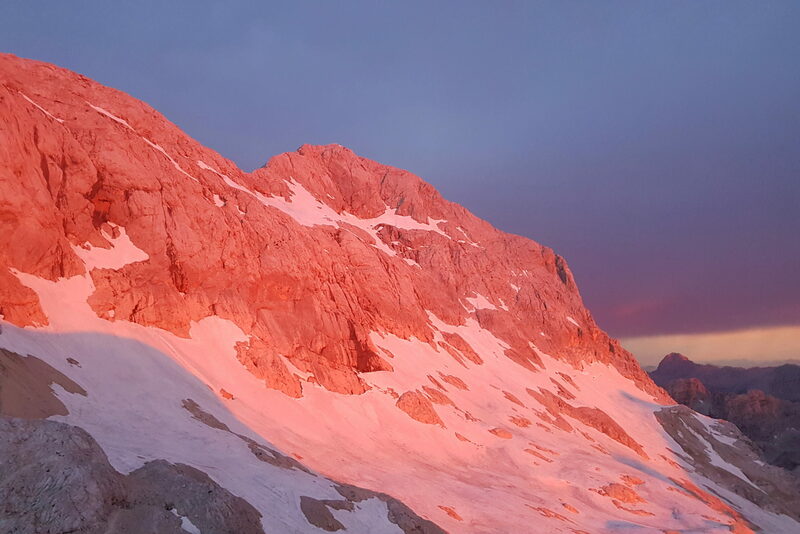 It was early August, so to speak the peak of the mountaineering season for most of the country, and the sun was about to spread its first rays over the sleepy slopes. 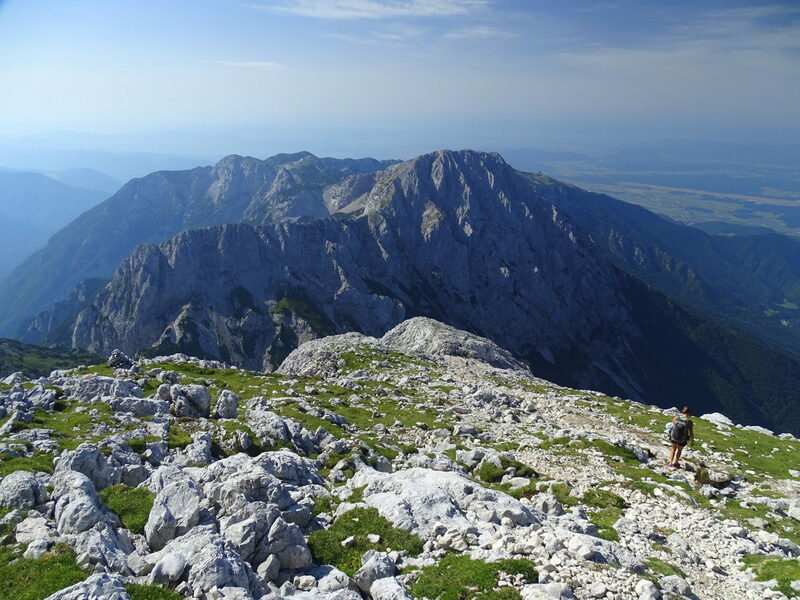 Besides a few other cars, my husband and I were among the few hikers to go up the highest peak of the Kamnik-Savinja Alps that day, Mount Grintovec. Heading towards the gray peak in the background, Mount Grintovec, 2,558 m.
The great mountain punches its challengers with quick elevation gain right out of the gate. Add to that our backpacks (because one’s got to go prepared, right? ), a summer heat wave that pushed temperatures up to 39 degrees C in the valley but not much less on the south sunny trail, and we had a few hours before the hiking turned unbearable. It’s either a go-early or don’t-go-at-all trail. We started at 6.33. Kind of early. 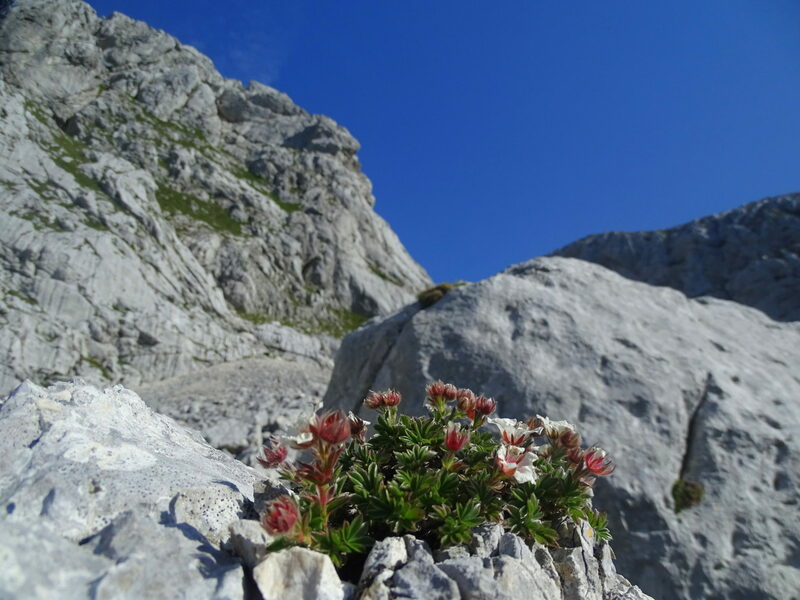 Summer is the time when wild flowers finally bloom in high mountains and to be exact, Grintovec is in full bloom right now. 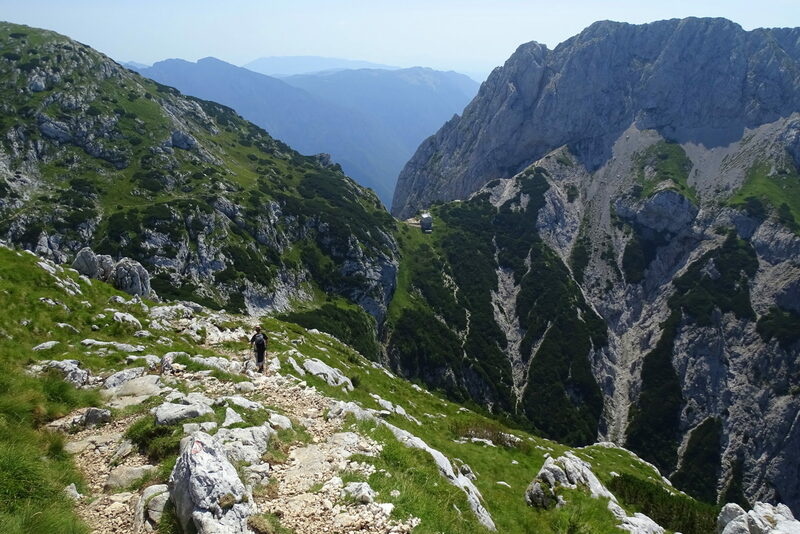 If you don’t mind the quick elevation gain, that’s a 1,959-meter gain in some ten kilometers (or 1,658 m in 7 km if starting a little further up the road from the trailhead ‘V Koncu’), Mount Grintovec makes an intense cardio, yet technically speaking, an easy trail without a single steel cable or a piton along the way. That’s the south approach from Kamniška Bistrica, a beautiful glacial valley at the southern foothills of the Kamnik – Savinja Alps, which goes up the mountains over a saddle called Kokrško Sedlo and the final slope ‘Čez Streho’ (Eng. Over the Roof). 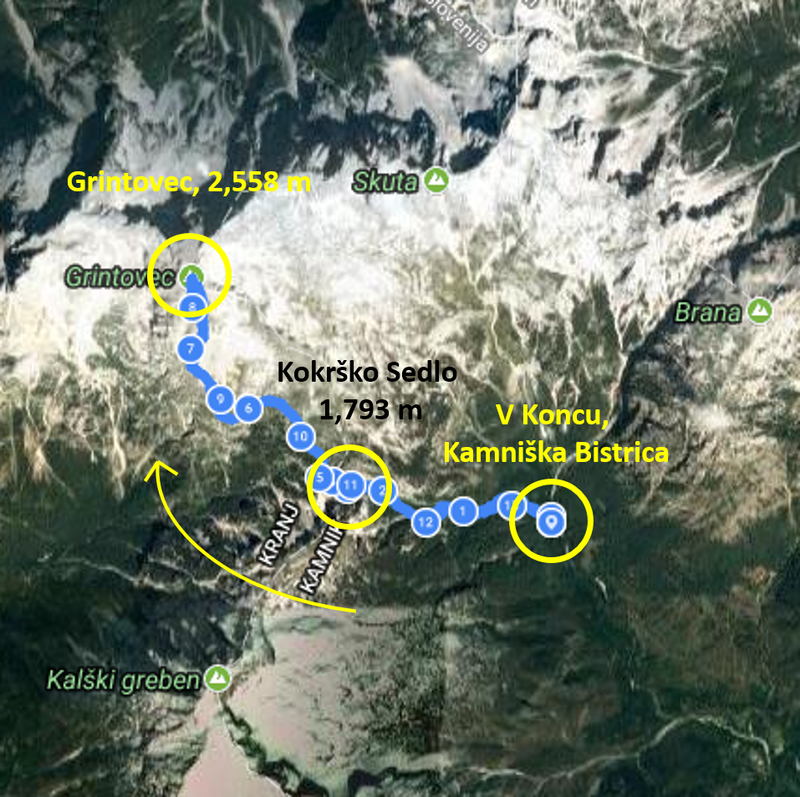 The easy south route to Grintovec starts in Kamniška Bistrica, passes a mountain saddle called Kokrško Sedlo and goes directly up over the easy Čez Streho slope. 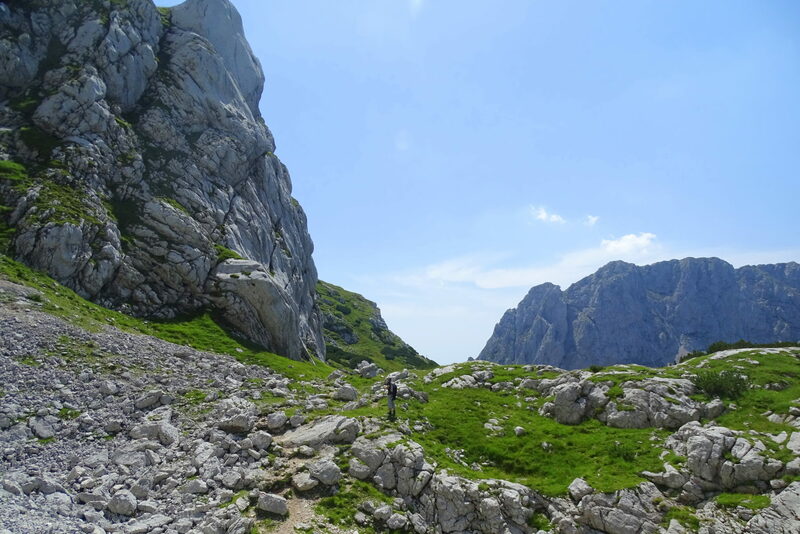 All other routes, most of which crossing the north face, are challenging climbing routes that require a helmet, climbing belt, via ferrata set, and, above all, experience. 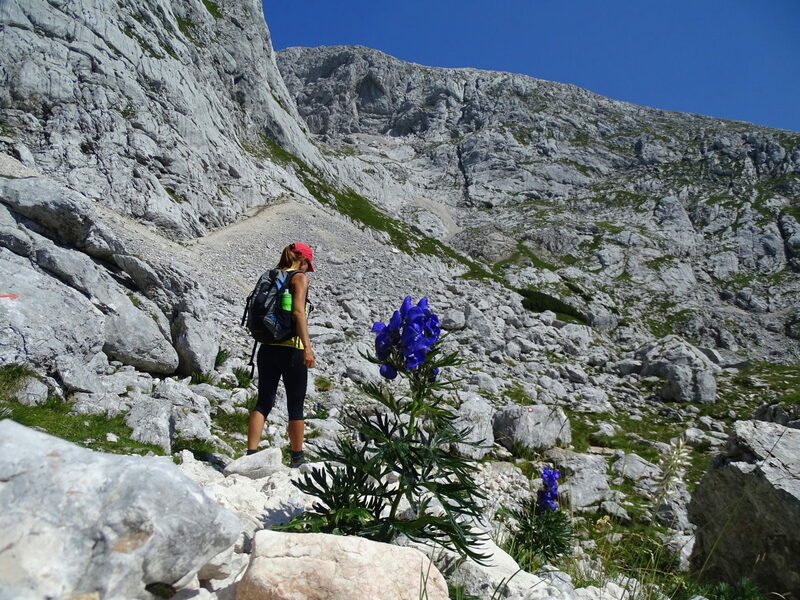 When I once hiked to Mount Grintovec from the south side, continuing across the exposed ridge over to its western neighbor Jezerska Kočna, and descending over its north face down to a place called Jezersko, I remember the route as spectacular, yet precipitous, eerie, and lacking a cable over a few exposed ledges. A route one needs to tackle prepared. 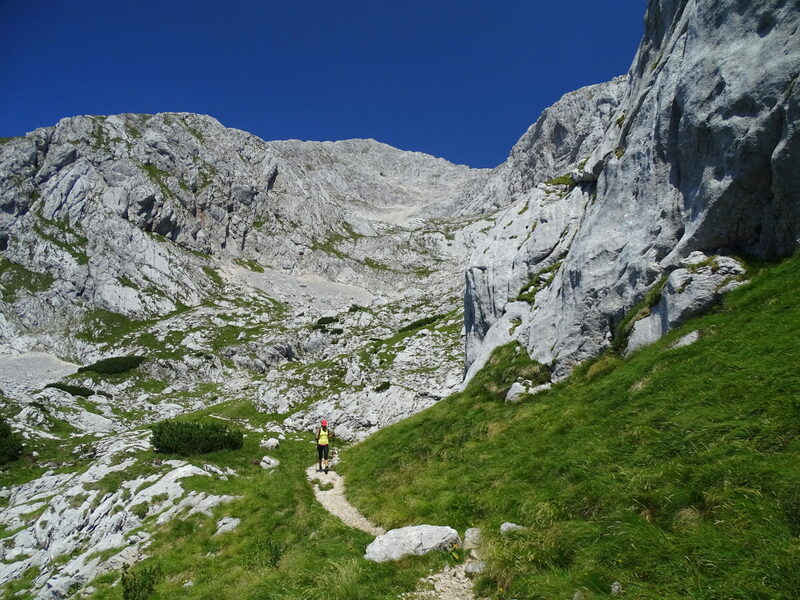 Grintovec’s north face offers technically challenging routes, none of which marked less than over 5:15 hours one way. 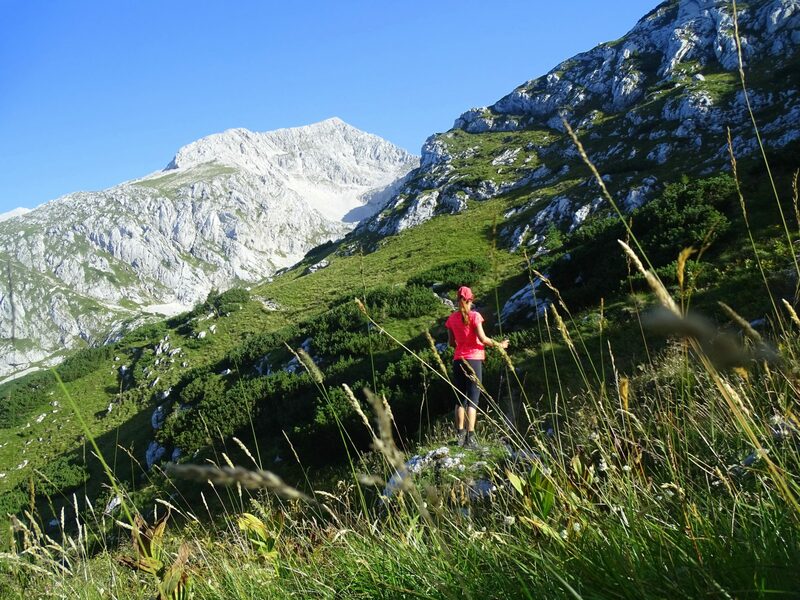 Grintovec is also part of the WMRA Grand Prix, an annual series of mountain running competitions organized by the World Mountain Running Association, which is with its extreme elevation gain of 1,959 m in 9.8 km also one of the most challenging yet beautiful runs at the WMRA Grand Prix. The best time of ‘Tek na Grintovec’ (Eng. Grintovec Run) since its first race in 1996? A New Zealander Jonathan Wyatt holds an unbeatable record of 1 h 15 min 43 s, which he set more than 10 years ago in 2006. I’ll rather say nothing about my snail time up to Grintovec, but let’s just say I wouldn’t qualify for the race… ? 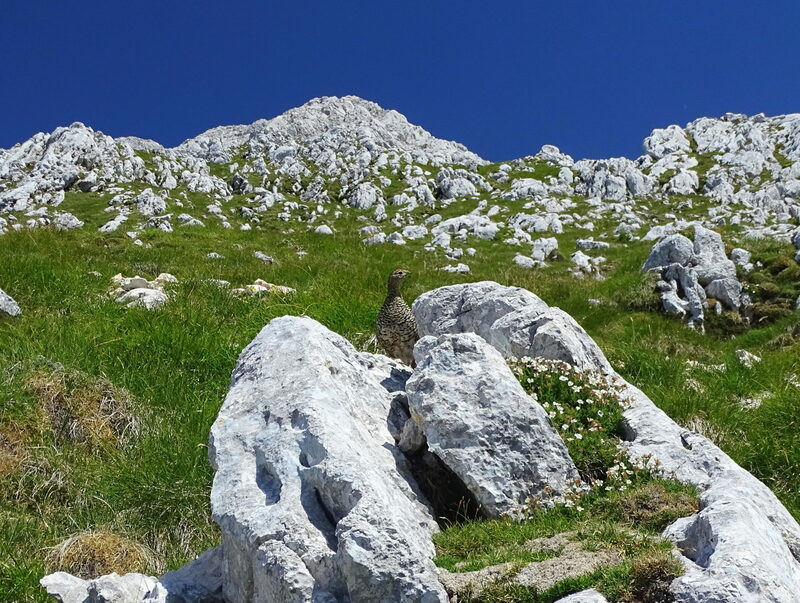 The top of Grintovec opens to otherworldly views over Dolgi Hrbet, Skuta, Brana and other mountains to the east and Kočna to the west. 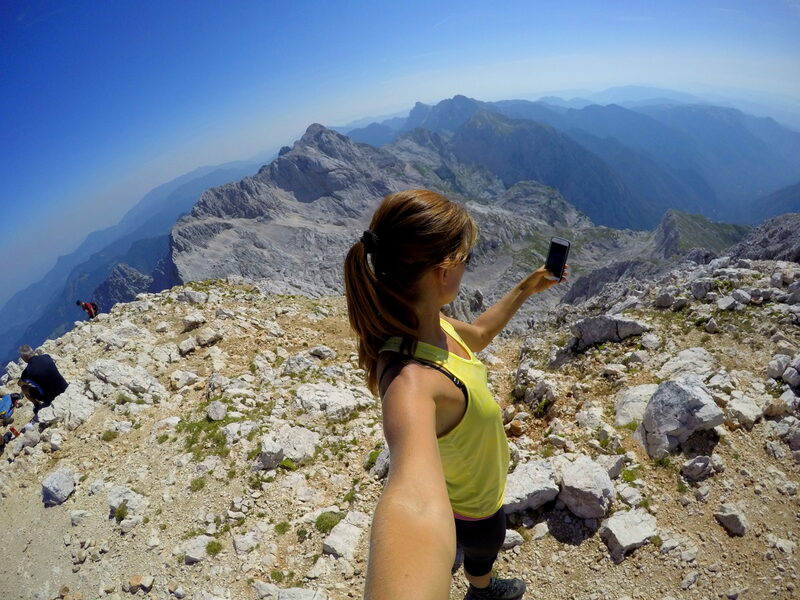 “Hey, Neja, let’s go, hurry up,” my husband’s voice kept echoing along the long way to the top. He was aiming to break our friend’s record during one of his attempts at the Grintovec World Cup runs, held at 2 h 15 min. If being a woman brings a lot of positive things, being dependent on endless hormone swings might not be one of them. About halfway somewhere near Kokrško Sedlo, already at 1 h 30 min, my husband wisely gave up the race and started to follow my pace instead. The mountain hut at Kokrško Sedlo, a mountain saddle connecting the highest point of that particular mountain range, namely Grintovec, with Kalški Greben. 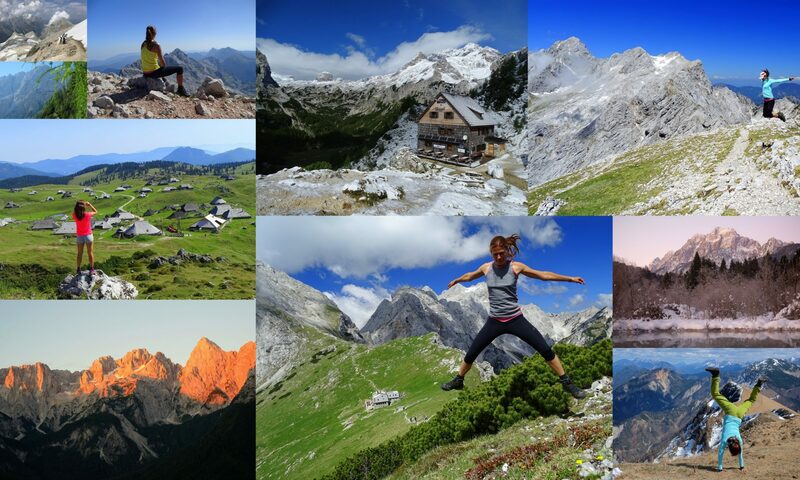 Due to the friendly route over its south face, Grintovec is one of the most frequently visited 2K mountains in Slovenia, not only during the warmer months, but throughout the year with the south route as its winter standard. Grintovec is a grand mountain that requires a lot of time and energy. We spotted this bird watching over its three youngsters. Nevertheless, our slower than usual speed would show its nasty results on the way back. 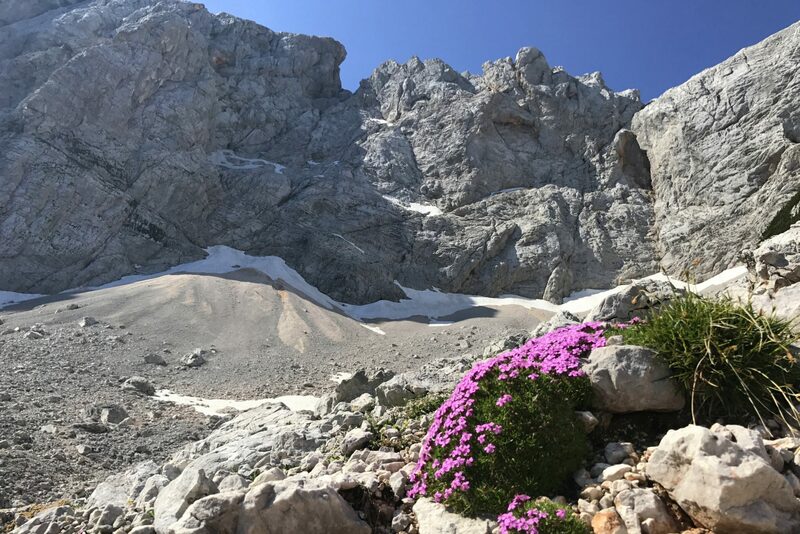 By the time we reached the top, the heat had already sprawled over the high mountains, and if I’m used to wearing a wind stopper at the top, I was just fine in a thin summer tee. The descent was long and hot, wringing every bit of moisture out of our bodies. The big finale? Refreshing ourselves with the 5 degrees C spring water of the Kamniška Bistrica River back at the trailhead. It felt awesome! Prečudovite slike in celoten blog.